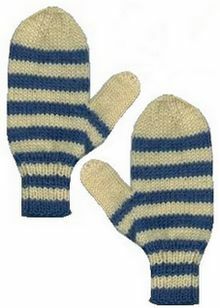 Here’s an easy striped mitten knitting pattern for holiday gifts! 1 skein each 2 colors of your choice (I used Blue Boy #79 and Sun Yellow #13). You can easily get 2 pairs of mittens from the 2 skeins of yarn. size #6 for the main part of the mitten). 2 ring markers and a small stitch holder for the thumb gusset. 4 1/2 sts=1″ on #6 needles. My pair will fit an average size adult hand comfortably (I like my mittens to be a bit roomy). Claudia says to subtract 6 stitches for a child’s size & to add 6 stitches for a huge adult hand. Stripe Pattern: Work 4 rounds in Color #1, 4 rounds in Color #2, repeat. With #4 needles and Color #1 (Blue Boy in my pair), cast on 32 stitches. Join and work in knit 1, purl 1 ribbing in the round, placing a stitch marker at beg of round. Work in stripes (switching colors every 5th round) until cuff measures 3″ or desired length–my mittens have 3 blue stripes and 2 yellow stripes, and ended after the 4th round of the blue stripe. Continue working in stripe pattern as established! Switch to #6 needles; *knit 8, make 1 st*, repeat around: 36 stitches (I “make one” by picking up the bar between stitches and knitting into the back of it. Makes a nice nearly invisible increase). Next round: Knit 1, place 2nd marker, knit around. Round 1: slip 1st marker, make 1 stitch, knit 1, make 1 stitch, slip 2nd marker, knit around (38 stitches). Repeat rounds 1 and 2 until there are 13 stitches between the 2 markers/48 stitches total (your 2nd increase round will be: slip 1st marker, make 1 stitch, knit 3 stitches, make 1 stitch, slip 2nd marker; 3rd inc round will be: slip 1st marker, make 1 stitch, knit 5 stitches, make 1 stitch, slip 2nd marker, etc). finger (4″ above the thumb gusset in my case). Round 1: *knit 4, knit 2 together*; repeat around: 30 sts. Round 3: *knit 3, knit 2 together*; repeat round: 24 sts. Round 5: *knit 2, knit 2 together*; repeat around: 18 sts. Round 7: *knit 1, knit 2 together*; repeat around: 12 sts. Round 9: *knit 2 together*; repeat around: 6 sts (Note: I like to use a #4 needle for the last decrease round, as it helps alleviate those large ‘loops’ when you pull the final 6 sts. together). Cut yarn, leaving a 12″ tail; with a darning needle, run the yarn through the remaining 6 stitches and pull tight. Weave in end. Worked with Color 2 (yellow). Pick up all stitches on thumb holder, using #6 needles, arranging the stitches around the needles & picking up 3 stitches across the ‘bridge’ where you cast on the stitch when starting the hand–16 stitches. Join work, placing marker if desired to note beginning of round. Round 1: knit around (I like to knit into the back of those 3 picked up stitches on the 1st round to tighten them up and avoid a hole). Continue knitting around until thumb measures 2 3/4″ or desired length (should clear the top of your thumb nail). Next round: *knit 2 together*, repeat around–8 stitches remaining. Close as for top of mitten. Weave in all ends. “Striped Mittens” pattern © 2000-2014 By Laurie Kynaston; http://www.vintageknits.com. You may share this pattern on your on-line knitting pattern collections or in newsletters, providing this notice remains attached. (I would appreciate notification if you use this pattern!) This pattern is intended for personal use, or for charitable donations/sale. Please contact me at lavs@vintageknits.comt for permission to include this pattern in any written collection or to use it for commercial purposes.